What Does it Mean to Nationalize Banks and Industries? During times of financial crisis, the topic of nationalizing banks is likely to arise. Most bank customers and taxpayers are unaware of how that works, but the subject stirs lively debates. So, what does it mean to nationalize banks, and how would nationalization affect banks. Nationalization happens when a government takes over a private organization. Government bodies end up with ownership and control, and the previous owners (shareholders) lose their investment. For example, banks in the United States are typically businesses—not government agencies. The owners might be stockholders, a family, a small group of people, or other investors. Unilateral Action: In nationalization, ownership transfers to the government, usually as a unilateral decision. In other words, the private owners don’t decide or agree to transfer ownership—the government makes that decision for them. Shareholders typically have little choice but to accept the change. Stakeholder Losses: When nationalization happens, the previous owners and managers often lose (although management may be fortunate enough to keep their jobs). They no longer have an asset that potentially has value and can be sold, nor does their investment continue to provide income. Instead, the state owns nationalized assets. For that reason, nationalization is scary to those who own (or have an interest in) banks and other businesses. Nationalizing the banks can be a temporary measure, and it is regularly used to rescue banks in financial trouble. In fact, this happens quite often in the United States: The FDIC steps in, takes control, and sells the bank to another bank—usually over a weekend. FDIC takeovers typically happen when a bank fails due to insolvency. In those instances, the bank goes into “receivership” and gets “reprivatized” when sold to another bank. The period of government ownership is brief, and the bank is privately owned shortly after that. For most consumers, that system works quite well. Instead of losing your money in a bank failure, they’re protected by the federal government. In most cases, you’ll hardly notice when your bank fails. Federally-insured credit unions, which are owned by their “members” (or the customers) have similar protection: NCUSIF insurance. It’s unlikely that the banks will be nationalized, but anything is possible. The consensus seems to be that those measures would only be temporary—again, as part of a rescue during events like a financial crisis. Running banks would be a significant operational undertaking for the U.S. government (even if only the largest banks were nationalized). Scenario number one is most likely only if an extremely top-down regime were to rule the nation. Scenario number two was proposed during the mortgage crisis for banks categorized as “too big to fail.” Those banks were deemed to create an excessive risk to the global economy and U.S. taxpayers. However, other measures, like higher capital requirements, helped to reduce the likelihood of catastrophic failures. Ideology: Nationalizing an industry is controversial, particularly in the U.S. Developing nations have been known to take over industries during upheaval, but the U.S. tends to be a more hands-off environment. However, nationalization is possible whenever political forces make it acceptable. For example, industries that cause widespread suffering and populist anger are at risk of being nationalized. During the mortgage crisis, banks were the “bad guy,” and it was easy for lawmakers to take control of certain institutions. Healthcare is another example where individuals see abuse, a lack of transparency, and great suffering, making it fertile ground for change—including potential nationalization. Depending on your views, nationalization, or the threat of it, has several outcomes. Executives: When banks are nationalized, stakeholders (including executives with significant interests in the bank) lose money. Plus, executives with generous compensation packages may earn less. Ultimately, this discourages moral hazard. Shareholders: Investors who profit from companies that take risk also lose out. Ideally, this discourages investors from putting money into risk-takers and makes it harder for those companies to raise capital. Government Management: For better or worse, government agencies take over. Some argue that the government is ill-equipped to manage complex organizations and that politics can affect operations. 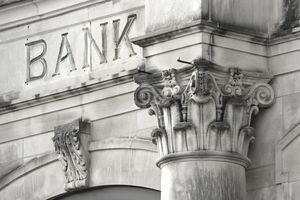 Others say that taxpayers can ultimately save money by rescuing troubled banks and bringing them back to life (without letting all of the benefits going to shareholders and executives). What Is the Available Balance in Your Bank Account? The Balance is part of the Dotdash publishing family.